Doug and I are trying to eat healthy and hopefully lose a few pounds in the process. Tonight for dessert, instead of his favorite (Ice Cream)... 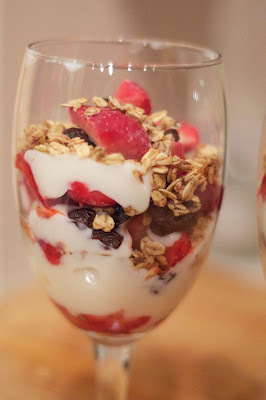 I made this Yogurt, Granola, Strawberry, Raisin Parfait. It turned out really good. I used low fat plain yogurt, store bought granola, frozen strawberries and raisins. I thought it turned out kinda of pretty!